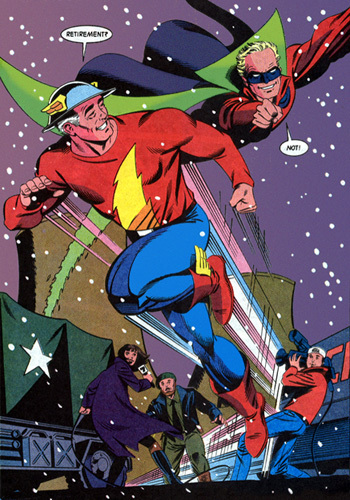 Before there was Hal and Barry, before there was Kyle and Wally there was Alan Scott and Jay Garrick, the original Brave and the Bold. Starting today, I’m going to look at the friendship between Green Lantern and The Flash. While many believe Hal Jordan and Barry Allen to be the true first Brave and the Bold; Jay and Alan were their first. Going back to the early days of Keystone City when Jay first gained his powers and Alan was passing by on his train. The two were fighting the likes of the Shade and the Fiddler before the formation of the Justice Society of America. What was very unique about the two characters at the time is you took a scientist and a hard working union man and made them into very blue caller super heroes of the day. The two through all their troubles, Alan with his first marriage and Jay dealing with problems having children with his life at such a young age, allowed the two to bound outside the role of capes and super powers. Then when Jay disappeared with Keystone City thanks to the Shade, the Fiddler and the Thinker; Alan did his best to carry on without his friend before ending up in Limbo with the rest of the Justice Society for years to come. Following their freedom from their prisons, the two joined back together and their friendship endured hard times with Jay dealing the Spirit King causing him to murder his fellow Justice Society teammate, Mr. Terrific and Alan dealing the reunion of his two children, Jade and Obsidian, which turned into a Jerry Springer episode for a long time until recently. Now, the two have worked through some hard times once more to come back out on top and prove to the world and to their fellow super heroes, they are truly the first ones to be known as the Brave and the Bold.